Awareness is like the sun. When it shines on things, they are transformed. Our Fourth Principle calls on us each to seek truth and meaning in our lives and in the world. A central human desire is for our lives to be meaningful, impactful. We want to matter. This is intuitive. It is not enough to simply find meaning though. It is important for the meaning that we find in life to be true. Religion provides many tools to help us find that truth. Buddhism calms the mind and helps us achieve clarity of thought. The Golden Rule of many traditions urges us toward choices that are good and harm none while loving ourselves and our neighbors. This month we are exploring the Fifth Source – which encourages us to draw on another resource to help us find what is true and meaningful: the resource of Science and Reason. As a physicist, the Fifth Source is one that is near and dear to my heart. In the past, before I joined Unitarian Universalism, I had a long-standing ambivalence about drawing on science for religious purposes. Part of my ambivalence was because I had been taught to rigidly separate Science and Religion. Often, people I loved and cared about would argue that faith could not be informed by logic and reason, because then it would not be faith. Faith was important to them; it was often vital to their endurance through harsh experiences, including losses. They believed the only way prevent science from affecting their faith was to never mix the two. Over the years, I came to realize that this understanding limited both faith and science. Specifically, it denied that science was of any value to a person of faith, and it limited faith to a particular belief in a doctrine, instead of embracing its potential to be a source of clarity. This was an important realization because the other part of my ambivalence was because religion has sometimes been used in biased ways. As a scientist, it is very important to me to avoid bias. This means keeping political scheming out of science, and it means keeping religious doctrine out as well. Religious doctrine requires an adherence to a particular doctrinal truth or a creed, which is an obstacle to objective research. Scientists are always seeking both the results that confirm our theories, but also those that might disprove them. A “failed” test can be as important, if not more so, than a test that simply confirms our expectations. It is by being wrong that our understanding grows. 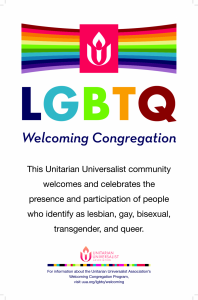 Unitarian Universalism has a powerful draw to me as a scientist, because it also does not bind us to a single doctrine (or religious bias). It also finds growth in being wrong and does not fear the unknown. It, too, questions. March 11 “The Wise Teacher’s Test” This story is from the Spirit Play CD. It explores the question of what – rightfully or wrongfully – is the right path of wisdom. March 18 “Origin of the Moon” This is a lesson from the Spirit Play CD that explores the scientific origin of the moon. March 25 “My name is Stardust” (Harris) – This story was written by a child with help from her parents. It explores the history of the universe and the amazing, wondrous fact of how we are connected to the very stars themselves. The Fifth Source: Reason and Science – Humanist teachings which counsel us to heed the guidance of reason and the results of science, and warn us against idolatries of the mind and spirit.